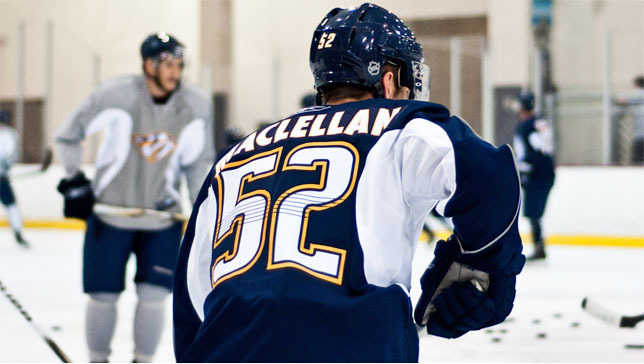 Nashville, Tenn. (March 10, 2012) – Nashville Predators President of Hockey Operations/General Manager David Poile announced today that the club has signed free-agent forward Jack Maclellan to a one-year entry-level contract. Maclellan, 23 (6/5/88), recently completed his senior season at Brown University where he led the Bears in points (15g-15a-30pts), goals and assists in 30 games played. The 5-11, 175-pound left wing also ranked sixth in the ECAC in power-play goals (8), tied for second in shorthanded goals (2) and tied for fourth in the conference in game-winning goals (4). Brown’s team captain for the 2011-12 season, Maclellan was recently named a 2011-12 All-Ivy First-Team Selection and finalist for the 2012 Lowe's Senior CLASS Award. He finished his collegiate career last weekend as just the 23rd player in school history to record 100 points, registering 101 points (46g-55a) in 121 games. The Calgary, Alta., native attended Nashville Predators Development Camp in the summer of 2011.